It is hard to imagine a more urgent moment for developing a language of critique and possibility that would serve to awaken our critical and imaginative senses and help free us from the tyrannical nightmare that has descended upon the United States under the rule of Donald Trump. In an age of social isolation, information overflow, a culture of immediacy, consumer glut, and spectacularized violence, reading critical books and thinking critically remain necessary if we are to take seriously the notion that a democracy cannot exist or be defended without informed and engaged citizens. This is especially true at a time when denial has become a national pastime matched only by the increasing normalization of one of the most alarming administrations ever to take hold of the American presidency. Against a numbing indifference, paralyzing despair, or withdrawal into the private orbits of the isolated self, there is a need to create those formative cultures that are humanizing, foster the capacity to hear others, sustain complex thoughts, and engage social problems. We have no other choice if we are to resist the increasing destabilization of democratic institutions, the assault on reason, the collapse of the distinction between fact and fiction, the legitimation of tribal identities, and the taste for savagery that now spreads across America like a plague. Reading the word means not only learning how to read the world, but also learning how to think critically and refuse to succumb to the unthinkable. The pedagogical lesson here is that fascism begins with hateful words, the demonization of others considered disposable and moves to an attack on ideas, the burning of books, and the disappearance of intellectuals, the emergence of the carceral state, and the horrors of detention centers and camps. Trump’s presidency may only be symptomatic of the long decline of liberal democracy in the United States, but its presence signifies one of the gravest challenges, if not dangers, the country has faced in over a century. A formative culture of lies, ignorance, corruption and violence is now fueled by a range of orthodoxies shaping American life, including social conservatism, market fundamentalism, apocalyptic nationalism, religious extremism, and white nationalism, all of which occupy the centers of power at the highest levels of government. Historical memory and moral witnessing have given way to a bankrupt nostalgia that celebrates the most regressive moments in American history. Fantasies of absolute control, racial cleansing, unchecked militarism, and class warfare are at the heart of an American social order that has turned lethal. This is a dystopian social order marked by hollow words, an imagination pillaged of any substantive meaning, cleansed of compassion, and used to legitimate the notion that alternative worlds are impossible to entertain. What we are witnessing is an abandonment of democratic institutions and values and a full scale attack on dissent, thoughtful reasoning, and the radical imagination. Trump has degraded the office of the president and has elevated the ethos of political corruption, hyper-masculinity, and lying to a level that leaves many people numb and exhausted. He has normalized the unthinkable, legitimated the inexcusable, and defended the indefensible. The history of fascism offers an early warning system and teaches us that language which operates in the service of violence, desperation, and troubling landscapes of hatred carries the potential for resurrecting the darkest moments of history. It erodes our humanity, and makes many people numb and silent in the face of ideologies and practices that mimic and legitimate hideous and atrocious acts of barbarism. Trump’s language, like that which characterized older fascist regimes, mutilates contemporary politics, disdains empathy and serious moral and political criticism, and makes it more difficult to criticize dominant relations of power. His toxic language also fuels the rhetoric of war, a super-charged masculinity, anti-intellectualism and a resurgent white supremacy. But it’s not his alone. It is the language of a nascent fascism that has been brewing in the United States for some time. It is a language that is comfortable viewing the world as a combat zone, a world that exists to be plundered, one that views those deemed different because of their race, ethnicity, religion, or sexual orientation as a threat to be feared, if not eliminated. 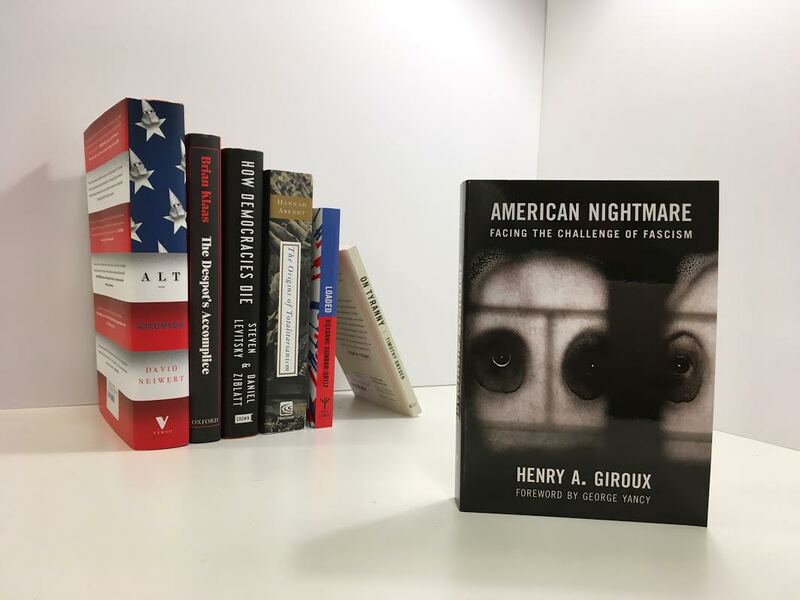 "The ghosts of fascism should terrify us, but most importantly the horrors of the past should educate us and imbue us with a spirit of civic justice and collective courage in the fight for a substantive and inclusive democracy. This suggests the need for rethinking the importance of historical memory, civic literacy, and the importance of reading as a critical act central to an informed and critical sense of agency." And while there is no perfect mirror, it has become all the more difficult for many people to recognize how the “crystalized elements” of totalitarianism have emerged in new forms in the shape of an American-style fascism. However frightening and seemingly impossible in a liberal democracy, the ghost of fascism cannot be dismissed because Trump has not created concentration camps or engineered plans for genocidal acts, though he has caged children and denied immunity to immigrants who if forced to return to their countries face an almost certain death. Fascism is hardly a relic of the past or a static political and ideological system. As Richard Evans, the renowned historian of modern Germany, observes the Trump administration may not replicate all the features of Germany and Italy in the 1930s, but the legacy of fascism is important because it echoes a dangerous “warning from history” that cannot be dismissed. Fascism is not static and the protean elements of fascism always run the risk of crystallizing into new forms. The ghosts of fascism should terrify us, but most importantly the horrors of the past should educate us and imbue us with a spirit of civic justice and collective courage in the fight for a substantive and inclusive democracy. This suggests the need for rethinking the importance of historical memory, civic literacy, and the importance of reading as a critical act central to an informed and critical sense of agency. Rather than dismiss the notion that the organizing principles and fluctuating elements of fascism are still with us, a more appropriate response to Trump’s rise to power is to raise questions about what elements of his government signal the emergence of a fascism suited to a contemporary and distinctively American political, economic, and cultural landscape. Hannah Arendt, The Origins of Totalitarianism (New York: Harcourt, Brace, Jovanovich, 1973). Brian Klaas, The Despot’s Apprentice: Donald Trump’s Attack on Democracy (Delaware: Hot Books, 2017). Are we in the beginning of a new fascist era?